Patsy Cline was an American country music singer. Part of the early 1960s Nashville sound, Cline successfully "crossed over" to pop music and was one of the most influential, successful and acclaimed vocalists of the 20th century. She died at the age of 30 in a multiple-fatality crash of the private plane of her manager, Randy Hughes. 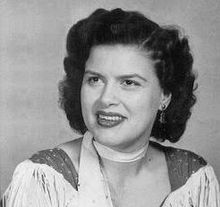 Patsy Cline (born Virginia Patterson Hensley; September 8, 1932 – March 5, 1963) was an American country music singer. Part of the late 1950s/early 1960s Nashville sound, Cline successfully "crossed over" to pop music and was one of the most influential, successful and acclaimed vocalists of the 20th century. She died at the age of 30 in a multiple-fatality crash of the private plane of her manager, Randy Hughes. Cline was best known for her rich tone, emotionally expressive and bold contralto voice and her role as a country music industry pioneer. Along with Kitty Wells, she helped pave the way for women as headline performers in the genre. Cline was cited as an inspiration by singers in several styles. Books, movies, documentaries, articles and stage plays document her life and career. Her hits began in 1957 with Donn Hecht's and Alan Block's "Walkin' After Midnight", Hank Cochran's and Harlan Howard's "I Fall to Pieces", Hank Cochran's "She's Got You", Willie Nelson's "Crazy" and ended in 1963 with Don Gibson's "Sweet Dreams". Millions of her records have sold since her death. She won awards and accolades, causing many to view her as an icon at the level of Jim Reeves, Johnny Cash and Elvis Presley. Ten years after her death, in 1973, she became the first female solo artist inducted to the Country Music Hall of Fame. In 1999, she was voted number 11 on VH1's special, The 100 Greatest Women in Rock and Roll, by members and artists of the rock industry. In 2002, country music artists and industry members voted her Number One on CMT's The 40 Greatest Women of Country Music and ranked 46th in the "100 Greatest Singers of All Time" issue of Rolling Stone magazine. According to her 1973 Country Music Hall of Fame plaque, "Her heritage of timeless recordings is testimony to her artistic capacity". Patsy Cline - Crazy (1961) Video Edit by CorbiOnn. A video slideshow in tribute to one the all time best female singer/songwriters ever. a tribute to the wonderful legend. Patsy Cline - She's Got You Thought I'd put this up because I've noticed that compared to other videos, the quality seems a little bit better. Hope you enjoy it!